Here we have a common enough scenario in Jesus' ministry. Jesus would do what is genuinely right and loving in accordance with the true intentions of the Law, and the scribes and Pharisees would become angry about it because they were being confronted for their own unloving and hypocritical hearts. But Jesus would not accept their hypocrisy and hatefulness no matter how much they sought to harm Him, and no matter how angry and frustrated they became, so we can be sure that He won't accept such wickedness in us either. And this sets up the focus of the passage before us this morning, in which we will see that 1) the Lord Jesus will not accept our hypocrisy, 2) the Lord Jesus will not accept our pride, and 3) the Lord Jesus will not accept our selfishness. The key to understanding what is really happening in this passage is found in Luke's statement that “they watched Him closely.” Indeed, this probably explains why Jesus was invited to a Sabbath meal at the house of “one of the rulers of the Pharisees” in the first place! So, based upon Jesus' previous track record, the scribes and Pharisees would have expected Him to see it and to want to help the man, especially since the man was put right in front of Him! And, of course, Jesus didn't let them down, but neither did He heal the man without making a point, as the next verse will show. Notice, however, that no one answered Jesus' question. But why not? Why wouldn't they welcome the debate? Perhaps it was because, deep down, they knew He was right and that they really couldn't win the argument. That is possible. But I think it is more likely that they didn't want to hinder Jesus from healing the man, since His ding so this would provide the very pretext they thought they needed to accuse Him of breaking the Law – at least as they interpreted the Law. Second, Jesus also responded to the situation by showing compassion on the sick man by healing him, after which we are told that Jesus “let him go.” In this way I think that Jesus showed an additional kindness to this man by dismissing him from the gathering. He let the man off the hook and made sure that the attention was no longer focused upon him. Jesus would no longer allow this man to be used by these hypocrites as a pawn in their cruel game. In fact, their use of him in this way actually showed that they viewed him as less important even that a common beast of burden, as Jesus' next statement indicates. Just as on that earlier occasion, so also here Jesus points out an exception that He knew full well all the scribes and Pharisees would allow for activity on the Sabbath. He knew they would allow someone to untie a donkey or an ox on the Sabbath in order that it may drink, and He knew they would allow someone to pull a donkey or an ox out of a pit on the Sabbath in order to save it's life. But Jesus makes explicit in the earlier situation what is implicit here, namely a charge of hypocrisy against the scribes and Pharisees, who would bend or break their own legalistic requirements when it suited their own selfish purposes – in this case to avoid the loss or ill health of an expensive animal – but they wouldn't allow any latitude at all when it came to helping a sick human being! Application: You see, Jesus simply would not accept their hypocrisy, and He won't accept our hypcrisy either! And – to the extent that we all have at least a little hypocrisy dwelling in us – we can be sure that Jesus desires to confront it in us just as He confronted it in them. 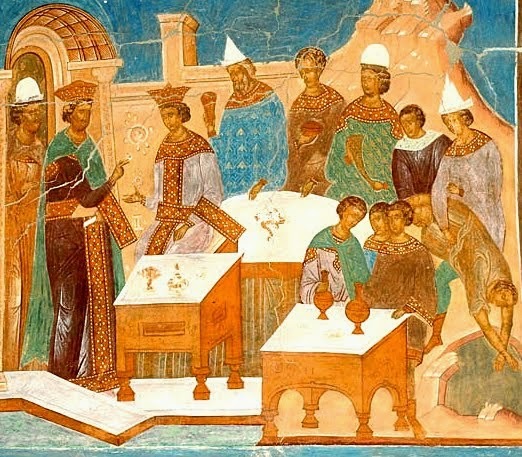 Now we arrive at the Parable of the Wedding Feast, which doesn't look like a typical parable of Jesus, yet we know it is a parable because Luke says it is. We find Luke's introduction to the parable in verse 7. But notice also that, since Luke identifies the following teaching of Jesus as a parable, we know that, asis typical in Jesus' other parables, what He is saying has pertinence not just with respect to our relationship to other people, but with respect to our relationship to God. And we know that He is talking about principles that apply to the kingdom of God. With this is mind, let's take a look now at the Parable of the Wedding Feast, in which a focus on the sin of pride and the necessity for humility are obvious. The meaning of this parable is easy enough to grasp, even for those as spiritually dense as so many of these scribes and Pharisees were. Jesus took a common situation – one in which they happened to be at the moment – in which one of them might seek to promote himself, and which could easily lead to embarrassment if he wasn't careful, in order to describe a kingdom principle. In the kingdom honor does not come to those who seek it, but to those who humbly see themselves as less deserving of honor than others. In the Church of Jesus Christ, there is no one who has faith in Christ who hasn't been given that faith by God. So there is no one who may look down on anyone else. NKJ Romans 14:4 Who are you to judge another's servant? To his own master he stands or falls. Indeed, he will be made to stand, for God is able to make him stand. But we must be quick to recognize that these same principles apply in our relationships to unbelievers as well, for we know that the only reason we believe and they don't is not because we are somehow better that they are or less sinful than they are, but rather because God has shown us His grace. Thus Paul confronts the pride that quickly ensues within us if we forget this important fact, a pride that leads us to be judgmental and hypercritical. Here Jesus makes use of what Biblical scholars call the “Divine Passive.” He says that “whoever exalts himself will be humbled, and he who humbles himself will be exalted” (italics mine), but He doesn't explicitly say who will bring about the humbling or exalting. That God is the one who will do the humbling and exalting is implied and would have been understood by those who heard Him. But, then, what was the man with the dropsy doing there? Was he an exception? Did this ruler of the Pharisees invite him for a loving and noble purpose? Apparently not! Apparently even the man with the dropsy was invited only because he could serve this ruler's own selfish ends. I think this is why Jesus admonished him saying, “But when you give a feast, invite the poor, the maimed, the lame, the blind.” In other words, if this ruler of the Pharisees had truly been motivated by a selfless love, then why weren't there more sick or poor people at his dinner? The reason, as we have already concluded, was that the man with dropsy was there simply to serve the ruler's purpose in trying to hurt Jesus. And this was a very selfish purpose indeed! 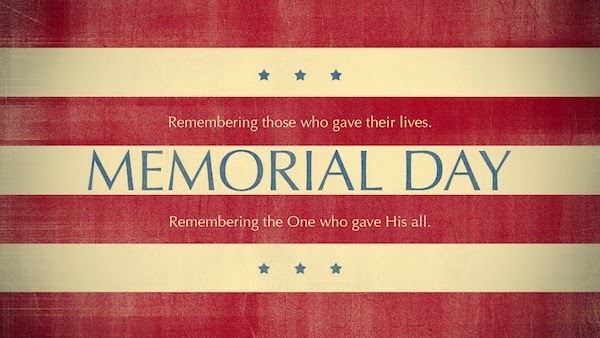 As we Christians remember those who have given their lives in defense of our country, let us not fail to remember that ours is ultimately a heavenly country (Heb. 11:8-16) and that our true citizenship is in Heaven (Phil. 3:20). And let us not, therefore, fail to remember those who have given their lives for Your glory and for the Gospel of Jesus Christ. May we ever be willing to follow their example, as they themselves have followed the example of our Lord Jesus Christ on our behalf "who, being in the form of God, did not consider it robbery to be equal with God, but made Himself of no reputation, taking the form of a bondservant, and coming in the likeness of men. And being found in appearance as a man, He humbled Himself and became obedient to the point of death, even the death of the cross" (Phil. 2:6-8). Help us also to remember, Holy Father, those who are currently serving our country in harm's way, especially those who have trusted in Jesus Christ as Lord and Savior. We know that some of them may even now be engaged in battle with the enemy, but we pray that they will remember who their ultimate enemy truly is and that they "do not wrestle against flesh and blood, but against principalities, against powers, against the rulers of the darkness of this age, against spiritual hosts of wickedness in the heavenly places" (Eph. 6:12). Help them, therefore, to remain faithful witnesses for Christ even under such enormous stress in the midst of grave danger. Grant them Your enabling grace, we pray, and impress upon our hearts the need to be as resolute and courageous in our service for you as they are, for we know that You are our only source of strength in our daily battle against sin and the devil. Help us finally, Holy Father, to remember most of all our Lord Jesus Christ, "the captain of [our] salvation" who was made "perfect through sufferings" (Heb. 2:10). Help us all to look to Him as "the author and finisher of our faith, who for the joy that was set before Him endured the cross, despising the shame, and has sat down at the right hand of the throne of God" (Heb. 12:2). "As it is written: 'For Your sake we are killed all day long; We are accounted as sheep for the slaughter.' Yet in all these things we are more than conquerors through Him who loved us" (Rom 8:36-37). We thank You, Holy Father, "who gives us the victory through our Lord Jesus Christ" (1 Cor. 15:57), and we humbly ask these things in the name of our Great God and Savior, Jesus Christ. Amen. Of course, such things are still being asserted by many, and what bothers me about such surmisings – at least in part – is the smugness of so many who seem to think that such liberals, gays, or abortionists are are all somehow worse sinners than they are themselves. They are thus quick to assume that these more wicked people surely deserve God's judgment in a way that they themselves do not. Here Jesus is informed about an event that must have happened while He was not around. We don't know the details of what took place, except that Pilate apparently killed some Galileans when they were offering their sacrifices in the temple, such that their own blood was mingled with their sacrifices. Perhaps these people were thought by him to be rebels, and he was waiting until they came to Jerusalem to get a chance to be rid of them. Notice the assumption that such a tragic thing as a man being born blind must have been due to some terrible sin having been committed by someone. And, of course, this was taken by many to mean that they themselves must not be such bad sinners as this guy because they weren't born blind like he was. But, again, it is this very type of attitude that Jesus wants to confront in this passage, as we see in the following verses. When Jesus says that they will “all likewise perish,” He doesn't specify whether He is thinking of some judgment that God is going to bring on the people of Israel – such as occurred in A.D. 70, when Jerusalem was destroyed – or whether He is thinking of the ultimate judgment. Perhaps He has both ideas in mind, but I think that there is definitely an application to the final judgment. After all, isn't it the final judgment what we must all face if we do not repent? This is this same lesson that Jesus is offering in this passage, and this is what provides the context for the Parable of the Barren Fig Tree. And so, having seen the context of the parable, let's turn our attention now to the parable itself. 3) The expectation of fruit is also present in the use of both of these metaphors in their Old Testament contexts, just as there is the expectation of fruit in Jesus' combined usage of these metaphors. So, there is nothing unusual about fig trees growing in vineyards. Indeed, the fact that this was commonplace may be one reason that both fig trees and vineyards were used as metaphors for Israel. At any rate, I seriously doubt that Jesus' audience would have missed the meaning of the metaphors here. He was clearly using the example of a fig tree planted in a vineyard – a fig tree that should have produced fruit but failed to do so – as a metaphorical reference to the Jews of His day, just as the Old Testament prophets had done in the past. I think this must be a reference to the ministry of Jesus, in which God is patiently giving Israel yet one more chance to repent. He is giving them a grace period, but not for long! Sadly, most of the Jews rejected Jesus as their Messiah, even after He rose from the dead and gave the Holy Spirit to the Church. They failed to avail themselves of the kindness God had shown them in being so patient. They didn't understand what His patience meant, even though Jesus made it so clear. Conclusion: I would like to end where I began today, with a reminder of the way we all too easily see others as worse sinners than we are and thus as more deserving of God's judgment. This is what leads believers to be too quick to assume that some tragedy must be the judgment of God when it happens to others. But Jesus will have none of this prideful attitude, and neither would His disciples who followed His teaching. For example, the Apostle Peter later wrote, “For the time has come for judgment to begin at the house of God; and if it begins with us first, what will be the end of those who do not obey the gospel of God?” (1 Pet. 4:17 ). Peter is simply echoing Jesus' persistent position, and I am repeating it today. And so the Holy Spirit is reminding us that, when we begin to judge others, smugly thinking they must be worse sinners than we are, we need to be very careful. He is essentially saying to us, “Take a good look at yourselves first!” He is reminding us that we all live in a grace period, in which He patiently gives us time to repent and to trust in Christ. If you have not already done so, I hope you trust Jesus to save you from your sins, for you do not know when you may meet your end. Somehow, the American church (in particular) seems to excel in finding anything in the Bible that can be billboarded, sentence-sermoned, or bumper-stickered, and telling everybody that this is what they really believe. Here is my ultimate point: God gave us the whole Bible for a reason. The whole, entire thing is His Word, mightier than a two-edged sword and effective for correction, rebuke, and training in righteousness. I do not want to have anything to do with a spirituality that can be summed up in one catchy statement. 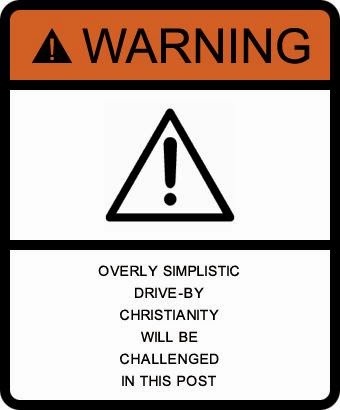 The Bible is inconvenient for our drive-by culture, and will not stand up to our vicious attempts to manufacture a drive-through Messiah. What’s more, “Love God Love People” isn’t even the commandment. “Love the Lord your God with all your heart and with all your soul and with all your mind.” But if we write out the whole thing, we won’t be able to fit “Love your neighbor as yourself” on the sign. Now, why might that be? To say “Love God Love People” and repeat it like a mantra is to be repeating the summary of the summary, the simplifying of the central. It’s the dumbed-down version of what Jesus said, and Jesus said a whole lot of other things that might be worth paying attention to. Like, “Truly I say to you, until heaven and earth pass away, not the smallest letter or stroke shall pass from the Law until all is accomplished” (Matthew 5:18). I highly recommend reading the rest of this thought-provoking post entitled All You Need Is Love (Love, Love, Love Is All You Need). When I read the parable of the rich fool, I cannot help but think of Howard Hughes [Younger people might think of Bill Gates]. I do not know that he was a fool, but I do know that he was rich. I also know, from some of the reports that went out at the time of his death, that while he had accumulated a great deal of wealth, he did not enjoy any of it in his last days, perhaps his last years. In this sense, Howard Hughes is a present day example of that against which Jesus was warning us in our text. I think he has hit on a problem for all of us here. 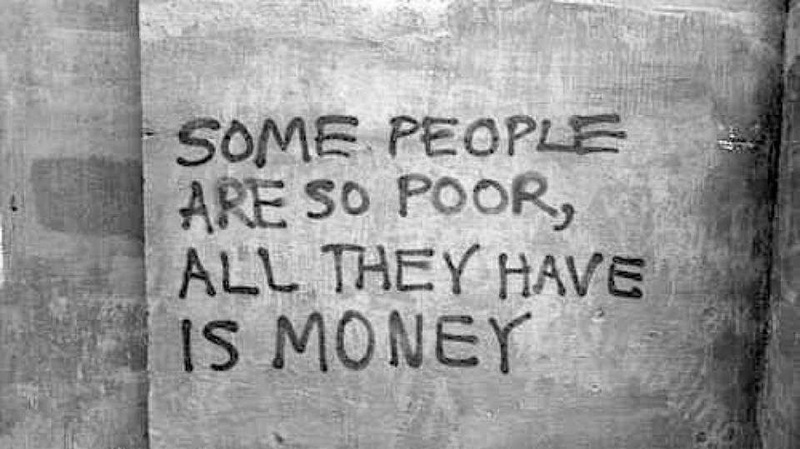 We probably all have the same tendency to think of this parable as pertaining to someone else when we read it – someone really wealthy, rather than someone like me! But we must remember as we examine this parable that it applies to us as well as to those whom we might regard as wealthy. Besides, by the standards of first century Palestine, most of us – if not all of us – would be regarded as wealthy anyway. So, without further ado, let's begin our examination of this passage. We will do so under three headings: 1) the context of the parable, 2) the communication of the parable, and 3) the consequences of the parable. As with a number of the parables, a request made of Jesus, or a question posed to Him, provides the context. Here we find that the same is true of this parable as well. In fact, this parable is intended to illustrate and expand upon Jesus' response to a request recorded earlier in this text, both of which are found in verses 13-15. Let's take a look at the previous request and the response by Jesus to better understand what is going on here. The request is found in verse 13. It is not necessary to get into the Old Testament laws regarding inheritance, since Jesus doesn't bother to do so. The point is that there is an inheritance to be divided and that the man wants Jesus to take his side in the matter. Apparently he saw Jesus as an authority whose word his brother would accept. The man doesn't seem to be truly interested in justice, though, since he doesn't ask Jesus to listen to both sides of the argument before rendering a verdict. This helps us to understand Jesus' response, to which we will now turn. The response of Jesus is found in verses 14-15. NKJ John 5:22-27 For the Father judges no one, but has committed all judgment to the Son, 23 that all should honor the Son just as they honor the Father. He who does not honor the Son does not honor the Father who sent Him. 24 Most assuredly, I say to you, he who hears My word and believes in Him who sent Me has everlasting life, and shall not come into judgment, but has passed from death into life. 25 Most assuredly, I say to you, the hour is coming, and now is, when the dead will hear the voice of the Son of God; and those who hear will live. 26 For as the Father has life in Himself, so He has granted the Son to have life in Himself, 27 and has given Him authority to execute judgment also, because He is the Son of Man. The answer to the question “Who made Me a judge or an arbitrator over you?” is obvious from this passage. It is God the Father who has made Jesus the Judge of all! But does the man realize this? I doubt it. In fact, I think the reason that Jesus answers the man the way that He does is in order to get him to think about it. The man has approached Jesus as though He is a judge, and he needs to stop and think about the implications of this, especially since Jesus is going to address the real issue that needs to be judged, namely the man's motives in seeking His help. Here is the real issue with which the man needs help. He needs someone to help him see his own covetousness, which, as Paul clearly teaches in Colossians 3:5, is idolatry. It isn't that Jesus is unconcerned about justice; but that He is all too aware that this man’s covetousness will do him more harm than not having his share of the inheritance. So this is the context of the parable, the exchange between Jesus and a man who is deceived by his own greed – a man who has lost sight of what really matters. This leads us to our second point. The communication of the parable is found in verses 16-20. As suggested by Klyne Snodgrass in his book Stories With Intent: A Comprehensive Guide to the Parables of Jesus, the parable itself may be divided into four movements (p. 394). We will follow his suggested outline. The first movement is about the plentiful yield of a rich man's field, and it is found in verse 16. Notice as we move on that the man's response to the abundant yield of his field is not to thank God as the giver of such a bounty, but rather to focus on what to do with it for his own satisfaction. Thus the man is falling prey to the very issue about which God had warned the Israelites when He brought them into the land in the first place. This will become apparent as we look at the next part of the parable. The second movement is about the problem presented by the unexpected yield, and it is found in verse 17. The man had clearly not expected nor planned for such a great harvest as he now knew that he could expect. This is why he had no room to store such a yield. But this would also mean that he has ended up with more than he actually needs, doesn't it? So what will he do? We will find out in the next part of the parable. The third movement is about the solution to the problem of the unexpected yield, and it is found in verses 18-19. Where is there any expression of thankfulness of God? Where is there any desire to use his unexpected and unneeded gains for God's purposes? Why does he not, for example, think of giving a greater thank offering at the temple, or of giving to the poor? What we see here is a selfish desire in the rich man to take it easy and use everything for his own satisfaction and comfort. In the process he is looking many years down the road, but he fails to realize that there may be other unexpected events that could take place, other than just this unexpected windfall. And this leads us to the final pat of the part of the parable. The fourth movement is about the unexpected judgment of God, and it is found in verse 20. A key term in this verse is the word translated required in the New King James Version. It is the Greek word apaitéō, which literally means “to ask for something to be returned” (Louw & Nida #33.165, BibleWorks), as when something has been borrowed and is owed back. It is used here “figuratively, of the concept of life as a loan from God” (Friberg #2458 , BibleWorks). In other Words, even the life or soul the man possesses does not really belong to him! This is why God calls him a fool, because he has thought and acted as though all that he has is his own, including his own soul. But in reality all that he has – including his own life – is from God! And God is demanding back the life He has given this man. The question God asks the man is, “Then whose will those things be which you have provided?” And the expected answer is that they will all belong to someone else! The man may not have thought one bit about sharing his possessions with anyone else, but in the end this is exactly what will happen. So, by hanging on so tightly to all that he has – including his own life – the man is actually losing it all in the end. What Jesus is doing in this parable, then, is actually just driving home a point He has made before, when He taught, “For whoever desires to save his life will lose it, but whoever loses his life for My sake will save it. For what profit is it to a man if he gains the whole world, and is himself destroyed or lost?” (Luke 9:24-25). And so now – after having looked at the context of the parable and the communication of the parable – we are lead, finally, to think about its consequences. The consequences of the parable are seen in the application provided by Jesus in verse 21. NKJ Luke 12:21 So is he who lays up treasure for himself, and is not rich toward God. That is, the one whose life is consumed with covetousness and earthly treasures, rather that seeing all that he has as having come from God and as belonging to God, will end up like this rich fool – with absolutely nothing! Indeed, he will have forfeited even his own soul! Being “rich toward God” means that we rightly acknowledge God as the source of anything good that we have, including our very lives, and we thank Him for these things and desire to use them for His glory rather than for our own selfish and sinful desires. There is no doubt that the Apostle Paul learned very well the lessons of this parable, and the Holy Spirit then inspired him to apply the same principles to us. May we also rely upon the power of the Holy Spirit to enable us to heed this teaching and to keep God and His glory as the central focus of our lives! May we each come away from this teaching with a deeper reliance upon the Holy Spirit to enable us to “seek the things above, where Christ is,” as Paul said to the Colossian believers, and “to set [our] minds on things above, not on things on the earth” (Col. 3:1-2). Introduction: This brief parable is given in the form of a rhetorical question, after which Jesus supplies the obvious answer in order to drive His point home. Then He goes on to offer some application of the parable's teaching. So, we will follow this simple order in our examination of the parable: 1) the question of the parable, 2) the answer of the parable, and 3) the application of the parable. As I have already indicated, this is a pretty long question, but it is pretty easily understood nonetheless. The question demands an answer something like, “Of course my friend would not refuse to help me in such a situation!” Jesus is simply asking us to think about how a friend would indeed get up in the middle of the night in order to help us with a need. And He assumes that we all have friends who would not refuse us but would help us out. After all, isn't this what friends do? So, in this parable Jesus wants to encourage the disciples not to be afraid to keep asking every day for their daily bread. He wants them to know that they can be confident in seeking God to meet their daily needs. If a friend would get up in the middle of the night to give us bread when we have need, then wouldn't God also give us our daily bread? Especially since He has commanded us to ask Him daily for it? This is the idea Jesus has in mind, which will become apparent when we go on to examine the answer. 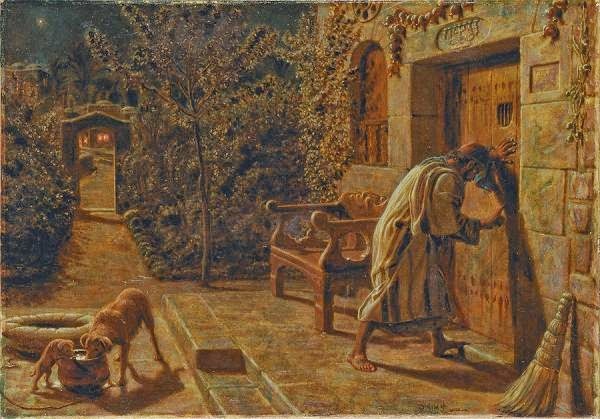 The application of the parable is found in verses 9-13, and, as we begin to look at Jesus' application of this parable, we will see that He appears to have two main points of application in mind. 1) The use of the present imperative in each instance – keep on asking ... keep on seeking ... keep on knocking. And we are to keep on knocking. This expects further action after having located the one we are imploring. It pictures us as persistently banging on the door to get the person's attention. But aren't these the very sorts of spiritual things that we ought to pray the most for and that we can be most confident about God's granting us? I say the answer is an emphatic, “Yes”! And this leads us to our next point.